A holiday in Siem Reap is incomplete without a night out on the legendary party road of Cambodia - known as Pub Street. The name "Pub Street" was officially coined by locals and travelers around 2008. - Photo credit: @jrvedonia (Instagram). Officially titled “Street 8”, Pub Street is the center of action as the night falls in Siem Reap. The street, starting off at the Red Piano Restaurant and ending at the Banana Leaf Restaurant, is a 100m stretch of road speckled with neon lit clubs, bars, restaurants, and vendors. 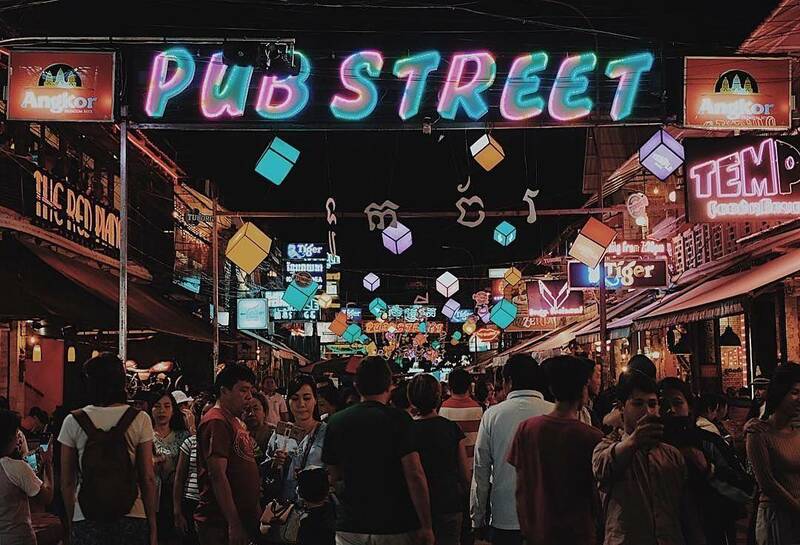 Located in the heart of the city nearby to the beautiful Siem Reap river and various markets, Pub Street is where backpackers from all over the world gather and dance the night away. It can be thought of as a more tame version of Bangkok’s Khaosan Road, but just as fun nonetheless. Come nighttime, the road is blocked off to traffic, making it a relaxing and safe place to stroll, dance, and let loose. With a wide variety of culinary treats ranging from Khmer specialties to Western favorites offered in food trucks, 50 cent drought beers, and crispy insect munchies to indulge in, you can spend your entire night on this lively street and never run out of things to do. The infamous Pub Street started off as a a small, 3-restaurant establishment on a humble stretch of dirt road in the heart of the city. The Angkor WHAT? Bar was the first club to open its doors on the street in 1998, closely followed in August of 2000 by the already closed “Singaporean Asian Rooftop” restaurant, and the Red Piano Restaurant. Other Pub Street well-known monuments such as Temple Club and Le Tigre de Papier came into fruition not too long afterwards. However, as described by a long-time Siem Reap living expat, there were more rats occupying Pub Street than tourists at that time. Around 2005, Pub Street was finally paved and turned into a cleaner road. With the success of Angelina Jolie’s blockbuster movie “Tomb Raider”, featuring the majestic temples of Angkor, tourists started to discover the wonders of Siem Reap, and began piling in to the parties of Pub Street. The name “Pub Street” was officially coined by locals and travelers around 2008. Today, the nightlife action extends to two parallel alleys, known as “The Lane” (located north of Pub Street) and “The Passage” (located south of Pub Street). Once you have an appetite going, indulge in one of the many dining experiences Siem Reap has to offer. For an authentic Cambodian experience, enjoy Cambodian BBQ, traditionally called “Sach Ang Phnom Pleung” or “Fire Mountain BBQ” – a culinary experience to remember for a life time. This meal consists of a BBQ aparatus in the shape of a volcano mountain, complete with exotic meats such as snake, crocodile, and frog to cook up. The broth boils in the pot below the volcano, which slowly cooks all of your vegetables and mouth watering noodles of choice. You can’t forget dessert after dinner! Siem Reap does not have a lack of sweet treats – try the famous Southeast Asian dessert, fried ice cream rolls, which you can find Cambodian ice cream makers frying up in various carts around town. After your stomach is full, try out a fish massage to prepare your feet for a night of dancing. Pregame with a chilly $0.50 draught beer from nearly anywhere on the street. Have a Tomb Raider Cocktail in the Red Piano Restaurant, known for being Angelina Jolie’s favorite hangout while she was filming her movie “Tomb Raider” in Cambodia in 2001. Continue on your way to Angkor WHAT? Bar for one of their famous cocktails served out of a chamber pot bucket, and to experience the sight of the infamous graffiti wall, a piece of long-standing Cambodian backpacker history. A night well spent in Siem Reap is almost always ended at the Temple night club. Temple creates an ambiance from a constantly shining strobe light, fog machine, popular dance tunes, and stages to get up on when you feel confident enough to show your moves to the world. Post your Pub-Street adventures to Instagram and don’t forget to add the hashtag #siemreapnet to be featured on our account! 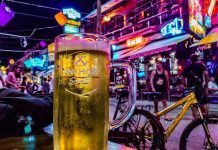 If you’re not quite feeling a wild night on Pub Street, it is worth your time to check out Sok San Street and the small streets around the Night Markets. 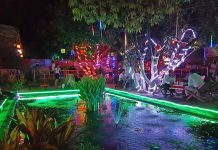 A growing number of backpacker bars and unique little pubs have popped up in the area over the last year or two including places like Peace and Love, Relax Bar and Karma Bar, for a more low-key night. When you are enjoying your exploration around Siem Reap, beware of a few common scams which happen throughout the city, such as the baby milk scam. Disenfranchised women living around Siem Reap are often pulled into the work of a scam artist who uses pity and empathy as a means of gaining money. If a woman with a sleeping or sick looking baby approaches you asking you to buy her baby some milk powder, it is best to say no. She will likely lead you to a mini-mart and beg for you to buy a large canister of powder, but as soon as you leave the vicinity, it’ll be promptly returned and half of the cash-back will be pocketed for profit. Elsewhere on this website, you can find more information about why it is best to not give money to beggars in Siem Reap.